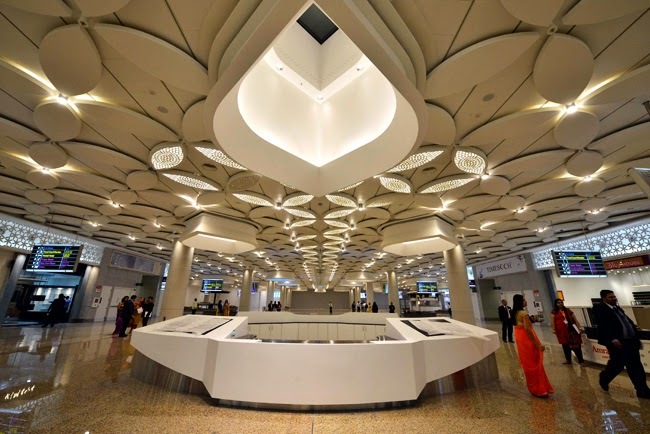 the new integrated terminal T2 at Mumbai's Chhatrapati Shivaji International Airport or the CSIA. After the privatisation of Mumbai airport was announced in 2006, it was handed over to a GVK-led consortium for upgrade and modernisation. The space-constrained airport had little air side space due to slum dwellings. It was a challenging project for GVK as it was one of the few live airports to undertake additional construction. It is difficult to engage in building work while airport operations continue. Built at an estimated project cost of Rs 12,500 crore, the rebuilt airport will shortly throw open its gates for domestic and international passengers. The terminal buildings are easily one of the swankiest in the country. 1. The terminal is a four storey building which will be able to handle a maximum of 40 million passengers annually. In a congested city with continous traffic snarls to avoid delays, passengers have access to the terminal through a dedicated elevated six lane expressway. 2. The airport sprawls over 42 lakh sq mtrs of terminal space. 3. Passengers complain about the endless walking involved at the new Delhi airport. At Mumbai airport, the 37 travelators, 48 escalators and 72 elevators will make movement convenient. 4. It has the country's tallest airport escalator at 11.6 meters. 5. Speedy check-ins and immigration will be a huge plus. There is about 50,000 sq meters of check-in space with 188 check-in counters, 60 immigration counters (for departing passengers) and 76 counters for incoming fliers. 6. The car park at the airport will be able to accommodate 5,200 cars at any point. The nine storey car park is one of the biggest in the country. 7. The car park is expertly camouflaged. Passengers only see the largest open garden in Mumbai. 9. The retail space at the airport is a shoppers delight spanning 21,000 sq meters. Formerly, the airport had only 5000 sq meters. 11. The steel used for the two roofs of the terminal would have been enough to build two Eiffel Towers. Post by Learn With Harsha.